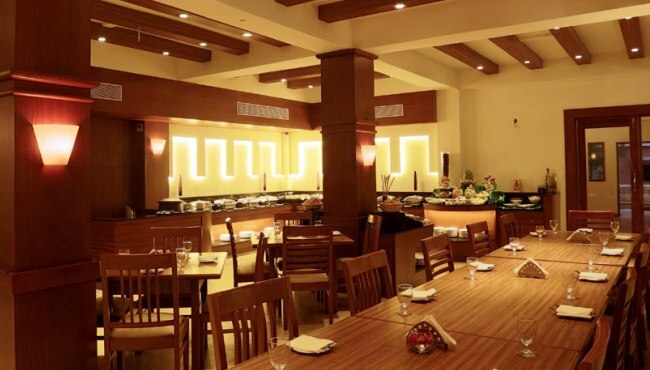 Three on-site dining venues provides convenient options for guests of the Country Inn & Suites in Candolim. Mosaic Restaurant, which is open 24 hours a day, serves globally inspired dishes and premium cocktails, while the Lobby Bar provides a great spot to grab a drink and an appetizer. Make your way to our Poolside Bar-B-Que Grill & Bar to enjoy a well-crafted meal in the beautifully landscaped hotel courtyard. This restaurant also features live entertainment many nights. In the mood for a late-night snack after your busy day of touring the area? Head down to Mosaic or order something from the room service menu, which is available all day, every day. Kick-start your evening with a stop at the Lobby Bar, where you can prime your palate with a snack and a handcrafted cocktail. For memorable international cuisine, dine at Mosaic, our 24-hour restaurant that also serves premium liquors and fine wines. Grab a drink from this poolside bar or order a plate of barbecue to enjoy in the lush courtyard. You can also relax to live music on Tuesday, Thursday, Saturday and Sunday. Don't miss the Sunday poolside brunch for a delightful meal outdoors. Treat your significant other to a private candlelight dinner in your room or suite. Thanks to the hotel's 24-hour room service menu and staff, you can make any occasion like a wedding anniversary extra special.